Our journey coincides with a season known as Lent. It is a forty-day period when we look inwards for signs of new life and symptoms of anti-life. Yes, we are a work in progress, and often the trajectory is anything but straight! We will sight Grace and Hope and the fruit of the Spirit. We will also see traces of dark, and shadows. Our normal human tendency is to avoid the latter. But Christ's finished work on the Cross means we no longer fear the dark side. Our goal however is not to clean ourselves up to be good enough or dwell on our sins. Our focus in on the new life - the hope of Resurrection which we will celebrate at the end - on Easter. Yet, the defining lines of Grace upon our lives takes on bold relief when it is contrasted with the dark. This seeing leads us to dig deeper into gratitude and greater dependence upon God who alone saves. When this idea gently landed upon my heart late 2013, it was clear that our focus this season had to be Jesus. He who came to offer us life; and lived on earth so we can see how life ought to be lived. 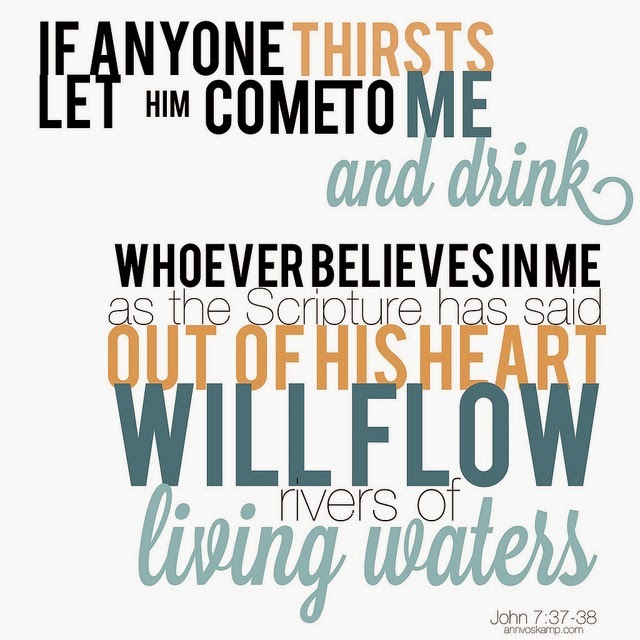 "If you knew the gift of God, and who it is who says to you, 'Give me a drink', you would have asked Him, and He would have given you living water....whoever drinks of the water that I will give him shall never thirst..."
If you know, you would ask, he would give. And that, we do not ask, because we do not know. What is it that we fail to know? I am thirsty. I am guessing you are too. That's pretty normal. The conditions are dry. The world promises to slake out thirst and feed our appetites but we have found that what we drink dehydrates and what we eat are actually appetite suppressants. After all, Truth, grace and love; faith, hope and joy aren't the things that get celebrated this side of heaven. Just so far in 2014, what wind has whipped your sails? What words spoken, and left unsaid, has left you tired and feeling forgotten? Perhaps you have even tried a few wells; dug one or two yourself. How can we connect what we need to KNOW and what we ASK then? What blocks us from knowing, and so, from asking? Sometimes it can get hard to ask God. We needed the solutions yesterday. Our bosses and children are not going to wait forever. I have found very often that I totally skipped the asking. So I miss the drink -the water that refreshes, hydrates, enlivens us. We try to do life half-dead really. Jesus stands before you and me, and asks, "hey, look up, look at me. You forgot to ask me. For if you knew God's gift you would ask and you would receive..."
Look up. Look at God's gift right now standing before you. Look at him looking back at you. Look. Ask. Go on, ask for a drink. leave a note of encouragement, a Q, an insight in the comment below. "If any of you lacks wisdom, let him ask God, who gives generously to all without reproach, and it will be given him."ESV. how true. God invites us SO OFTEN to ask, and we simply forget to - because we are so used to depending on ourselves!